Artist’s impression of the planet around Proxima Centauri. The brightest star is Proxima Centauri; the two other bright stars in the background represent Alpha Centauri A and B. Image created by the European Southern Observatory (ESO). I’m sure you’ve heard of Proxima Centauri recently. It’s the closest star to us. As of August this year, it’s also the host star of the closest known exoplanet — in all likelihood the closest exoplanet we will ever find. Perhaps you also know Alpha Centauri, a two-star system which comprises Alpha Centauri A and Alpha Centauri B, the second- and third-closest stars to us. 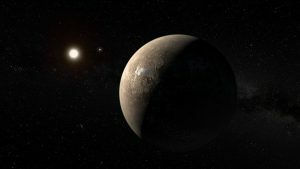 Since Proxima Centauri was discovered over 100 years ago, it has been suggested that all three stars are part of the same system — that they are “gravitationally bound” and orbit each other on a timescale of thousands, possibly millions, of years. The strongest argument for this has been the stars’ close proximity to each other, combined with their similar speed across the sky (“proper motion”) — such similarity is unlikely to be a coincidence. However, until now it has never been proven by considering the orbital mechanics. Today’s authors set out to do just that. The historic difficulty in answering this question has been the lack of precision in measuring Proxima’s radial velocity (the speed with which it moves towards or away from us). This can be found from a spectrum of the star by measuring its Doppler shift, but Proxima’s faintness has until now made that difficult. With modern spectrographs designed for the exoplanet era, we can get the precise measure of Proxima’s velocity that we need. The team used recently measured radial velocities for Proxima and Alpha Centauri of –22,345 m/s and –22,393 m/s respectively, each precise to around 3–4 m/s. The negative radial velocities just mean that the stars are moving towards us. When using velocities of this precision, however, there are a few systematic offsets that we need to take into account. 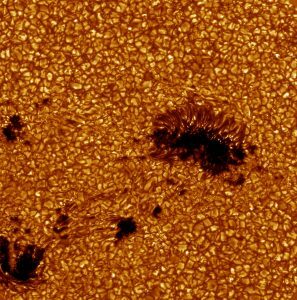 Photograph of the Sun’s surface, showing granules as well as several sunspots. Typically these granules are around 1000km across. Image credit: Oddbjorn Engvold, Jun Elin Wiik, Luc Rouppe van der Voort, SST. The surface of a star is not stationary. Look closely at any star and you’ll see little “convective cells”: patches where hot material rises in the centre, cools, and falls at the edges. (You can see the same effect in a pan of boiling water.) Amazingly, this is enough to change our measurements of the star’s velocity. More of the surface area of these cells is taken up by the rising material than the falling material, and the rising material is hotter and therefore brighter. The two combine to make it look as though the star is moving towards us slightly faster than it actually is — in our sun it changes our velocity measurements by 322 m/s, which is definitely measurable, so we need to take this into account. The size of these convective cells depend on the star’s temperature and on the strength of its gravity at its surface. Fortunately, the convective cells are well known for Alpha Centauri A and can be derived from orbital dynamics for Alpha Centauri B, while the effect can be neglected for Proxima due to its low temperature. As a photon leaves the gravity well of its star, the star’s gravity stretches its wavelength out and makes it appear redder. The effect depends on the mass and radius of the star. 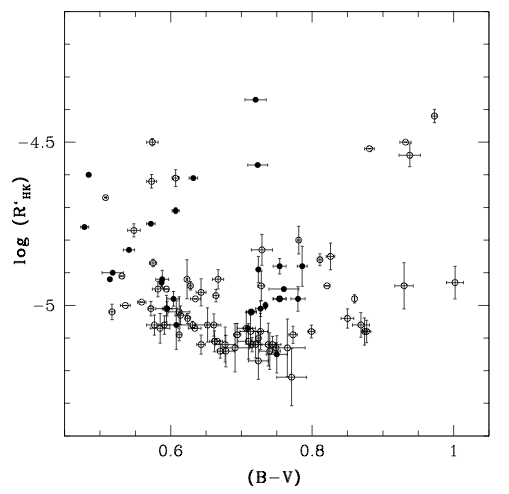 For Alpha Centauri A and B we know these, and so we can calculate the redshift directly. To give an example of the scale, Alpha Centauri A has a gravitational redshift of 575 m/s. For Proxima this is slightly trickier as its mass has not been directly measured. Instead, the team estimate Proxima’s mass based on its brightness by comparing it to a sample of similar stars. They find a redshift of 504 m/s to a precision of 17 m/s. This is much less precise than the measurement of the uncorrected velocity, making this the limiting factor in the team’s velocity measurements. 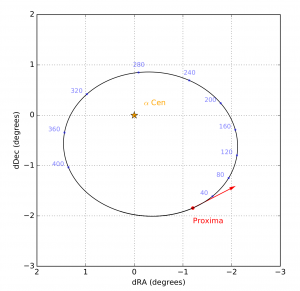 Predicted orbital path of Proxima Centauri on the sky, with blue numbers marking future positions every 40,000 years. This is Figure 1a from today’s paper. Dynamics: Is Proxima Bound To Alpha Centauri? If the two systems are bound, their velocities relative to one another must be less than a certain limit, effectively given by the point at which the kinetic energy of the system is more than the gravitational energy. In the case of Alpha and Proxima Centauri, that limiting speed is 545 m/s. The team calculate that Alpha and Proxima Centauri are moving apart at a rate of 293 m/s. In other words, the three stars are well and truly bound together. The team finished by calculating the orbital dynamics of the system. They predict that Proxima will orbit Alpha Centauri on a period of 600,000 years, at a distance ranging from 5,300 to 12,900 times the distance between the Earth and the Sun. So now that we know for sure that the stars are bound, what does that tell us? 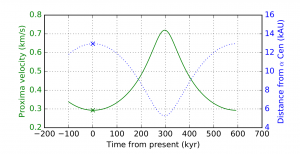 For people who are modelling formation of Proxima’s planet, it may be interesting to look at how the orbital motion of Proxima may have affected the planet. For those who are studying the stars themselves, it tells us that the stars probably evolved from the same source material, which would make them the same age and give them the same amount of metals. As the system is at the extremely weak edge of gravitationally bounded systems, it could be of interest for scientists studying models of gravity other than the standard model. Most of all, though, it is the most definitive answer yet to a question that has been hanging around for over 100 years. Predicted velocity of Proxima Centauri and Distance from Alpha Centauri over next 600,000 years (one orbit), with current values of both marked by crosses. This is Figure 2 from today’s paper. It may be possible to receive a delayed re-radiated sigal from the proxima system that has been illuminated by a recent FRB that we will have shared. To clarify by “we” I mean Sol and Proxima. 60 years ago my grammar school had a 8in Newtonian for lunchtime inspection of the sun, I still recall (no health and safety) the granulation viewed through the low transmissio H A filter that got hot. The conclusion is that Procima is bound to the Alpha Centauri A & B star system. However, brown dwarf stars could not be bound to the Sun if they are more than about 490 AU to 50 billion miles away according to Van Flandern and Hynek respectively. A passing star would eject it from the Alpha Centauri A & B system. The presence of a brown dwarf star near Proxima Centauri could resolve this conflict. Does this mean that in 300,000 years or so, Proxima will be on the opposite side of Alpha and will (at least temporarily) no longer be the closest star to earth (other than the sun, of course)?